Ok, so if you are use instagram you know how easy it is to find yourself browsing random users photo streams right? There’s no way that I’m the only one. It’s so easy to see who likes what pictures on that little social network and you can so easily go from one user to another. (If you have instagram you know what I’m talking about…) Anyways, the other day I came across some girl’s instagram feed and I quickly glanced through her pictures. She seemed to have it all together, and definitely looked like a model. Perfect hair, perfect body, perfect makeup….she had it all together. In no time, I was thinking to myself “Ooh, I want her hair.” “I want…” And started comparing. Yikes. It is amazing how quickly we as women can start comparing. Maybe it is all just vanity. Maybe even covetousness. Whatever it is, it isn’t good. As I kept looking through a few of her pictures, I was reminded once again that I needed to totally re-focus myself and my thoughts back to what true beauty is. It is so easy to lose sight of this sometimes! I needed to be reminded to stop those little thoughts before they evolved into coveting. To not compare. To not even look at things that would make me discontent with what the good Lord gave me. If I know that true beauty is reflected from within- If I know that I should not be comparing then that’s that. But what am I going to do about it? Maybe limit my time on social network type things, not look at certain magazines, or even Pinterest. (Even though I don’t use Pinterest but…still. You get what I’m saying!) The fact of the matter is that my time can be spent either comparing or I can be investing in the word of God or simply reading things that will help me grow. I can be looking at pointless pictures that are really, really unattainable or I can be thanking God for what He has blessed me with. Either way- once again I need to remember that true beauty is defined inwardly, definitely not outwardly. Great reminder. I find myself doing the same thing. What a lovely reminder, I too know how easily it is to sit on Facebook and other sites and compare my lives to theirs. What a good reminder to open the Word of God because His is the only opinion that matters. In the world we live in, it is a daily trail… I always try to remind myself that “comparison is the thief of joy.” And like that beautiful verse says, it’s all about where we set out minds! This is such an honest, beautifully written post. I think the comparison game is something we all find ourselves playing from time to time. Thanks for the reminder about where our true worth comes from! So true! I definitely needed to read this today! Thank you! Arielle, you are so right! This is where my heart has been lately. I’m still learning about photo composition and Photoshop, and I often look at pictures on other blogs and think, “I should be doing that!” It’s hard not to compare. But comparison is the thief of joy, and so I am trying to set my heart on how God wants to use my talents, not how I can use them to get more followers. Thank you for the reminder! Oh i love this post!! Im always feling this way, i saw pictures or even blogs and start comparing me with that girls. And then i feel like i dont know who i am. I never think that way, i need to be thankul with God for what he gave it to me. Nice post, and i love your blog!! Also i would love if you post a few tips of how to take natural light photography. Thank you for posting this, I needed to hear it. And by the way – i always think that when i look at your pictures – how pretty and stylish you are and how i would love to have your sense of fashion :) I love your blog and your heart for our Lord. Looking forward to reading more of your posts! What an honest and truthful post! Thank the Lord for speaking his wisdom through you today! I actually just went through a “blog purge” the other day and got rid of a lot of the blogs on my reading list that had me “coveting.” What really bothers me is that when I see one of those pictures, instead of reflecting on my own sinful thoughts of comparison/covetousness/lust/jealousy/etc, I blame the blogger! I think to myself, “well if she’s a Christian, she should practice what she’s preaching and stop posting about frivolous things like her fashion and makeup and post about her heart.” BAD ME! I’m so broken. Thank you for reflecting on these thoughts today and sharing! I don’t comment on your blog nearly enough, but your posts always inspire me! Thank you for your honesty, Arielle! I agree with one of the above posts- I sometimes think this when looking at your blog! 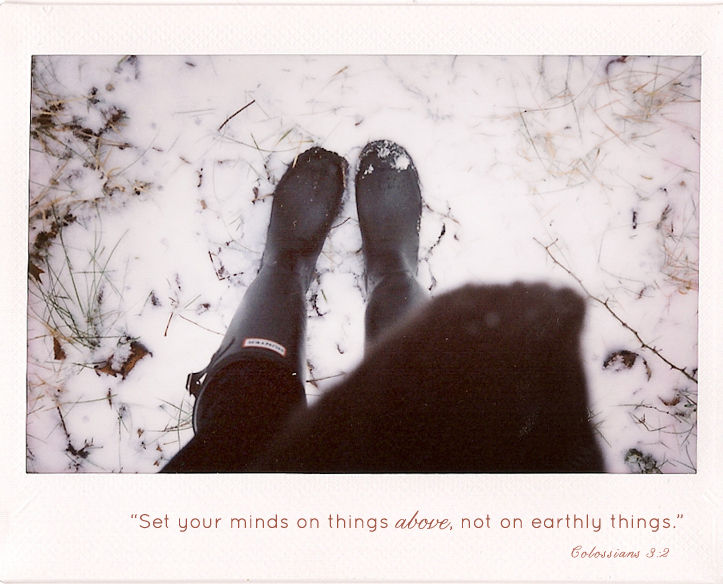 As women, it’s so easy for us to compare and set our minds on all these earthly things. Thank you for posting thoughts like this that help remind us to focus on Jesus and what he is doing in our lives. I love that quote at the end- where is it from? Thank you again! I read something interesting the other day from Eckhart Tolle “A New Earth”… when we feel inferior or superior, it’s our ego talking… your post made me remember these words of wisdom. Merry Christmas and happy new year to you Arielle. I have the same feelings too, but I’ve limited my use of social networks because comparing myself to others doesn’t really end up well. I get jealousy, resentment, bitterness, and self-hatred. I remind myself that each of us have unique gifts, and jealousy has no point. It took practice but when I see those who can be “prettier, sexier, etc.” than me, I admire them then move on, forget about nasty feelings. this resonates within my heart. Thank you, Ashley! :) xo! Thank you so much Nicole! I hope that you have a wonderful New Year! Xo! Hi Claudia! Thank you so much for your comment! I hope you have a wonderful new year :) Blessings!! Thank you Wendi! Hope you have a wonderful new year…Blessings! Yes, so true…myself included. I hope you have a wonderful new year! Blessings! you always say things i need to hear.